This is a great innovation among the graffiti scene because this is a very tough dye. What I mean by that is that the Dye Bottle 250ml it can be applied to a multitude of surfaces, hardwood, glossy plastics (5 species), Plastic mat (2 species), Fresh paint (4 species), Old paint (3 species), Glass-tile (3 species), Wood particle board, Metal (2 species) and Banner ads. Now that is a long list! 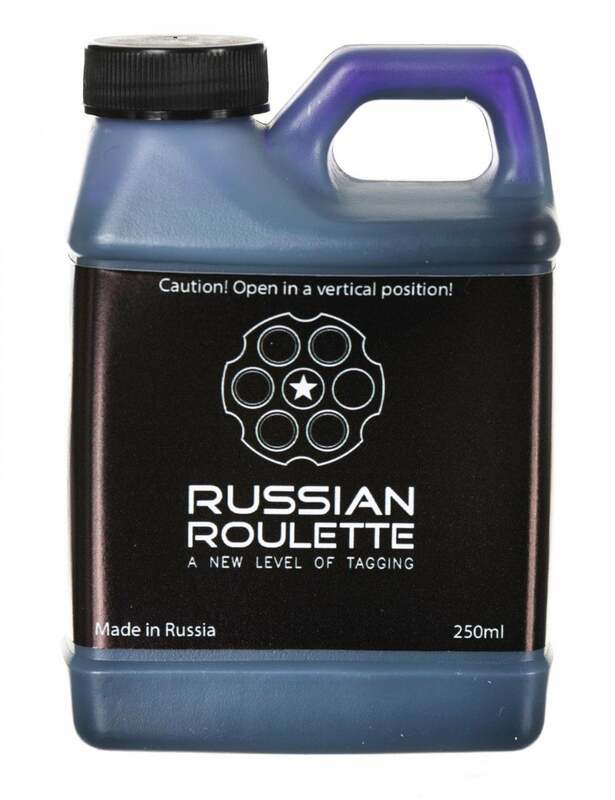 The brand, Russian Roulette, have a just "???????????" (Amazing) range of colours which makes it an easy on to recommend! I was originally going to use Lovely Jubbly but there is no Russian translation of that, how sad!